I never thought I’d be lying in the bedroom of the John Lennon and Yoko Ono suite at the Queen Elizabeth hotel in Montreal on October 6, 2011. But there I was having a 1969 redux ‘bed in’ – this time for peace, activism and cancer prevention. The hopeful spirit of the room still manifests itself in all the Lennon/Ono photos hanging on the walls along with the 1969 newspaper articles that have been framed. Breast Cancer Action Montreal (BCAM) wanted to invoke the spirit of John and Yoko by declaring that we all must take action to highlight the fundamental causes of cancers, not just the pink ribbon merchandising that takes place during this month of October which is Breast Cancer Awareness Month. Almost one in two Canadians will get cancer in our lifetime and one in nine women will get breast cancer. These statistics are unacceptable and more action is needed to focus on the primary causes of cancer. That is why BCAM booked the Lennon suite for a press event to alert the public that it is time to demand clear public information about the presence of chemicals in products that are known or suspected to cause cancer. BCAM and many others believe that if the public had more information about the presence of carcinogens in products through a clearly recognizable symbol then the public would avoid such products and send a strong signal to the market to screen out these ingredients. It is a simple ask. Particularly as the World Health Organization has been publishing a list of known or suspected carcinogens since 1971. The US National Toxicology Program goes even further by publishing a list of chemicals that are known or reasonably anticipated to cause cancer and clearly detailing where these chemicals are used in the workplace and in products. Consumers may not known that chemicals on these lists can be found in glues, adhesives, spot removers, paints, dry cleaning fluid, household pesticides, pet shampoos, lice shampoo, some hair products and cosmetics, and soft vinyl plastics. It’s also important to know that the state of California has been giving such information to the public for years so an important precedent has been set (click here for more information. So why are we not informed of the presence of these chemicals in common household products? And why does Health Canada, which is in charge of consumer safety, allow these carcinogenic chemical ingredients at all? I can only surmise that our government follows the old mindset that ‘ a little hazardous chemical is not a problem if exposure is limited.’ Never mind the countless exposures we have to carcinogens every day, nor the fact that mixtures can be more toxic than individual chemicals, nor the fact that safer chemical substitutes exist in the market. 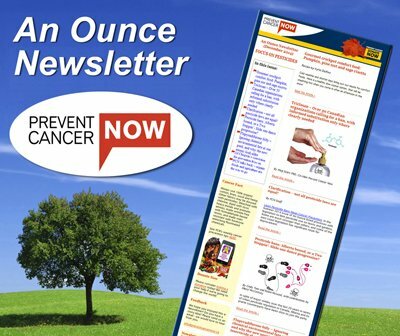 Even the Canadian Cancer Society advocates for product labelling. In a poll they conducted prior to the Ontario election on October 6th, more than 91% of Ontarians agree the next Ontario government should ensure all consumer and household products that contain known cancer-causing substances are labelled with a warning or symbol (visit here). It really is time to move to safer chemicals and clean production. But without ACTION nothing will change. 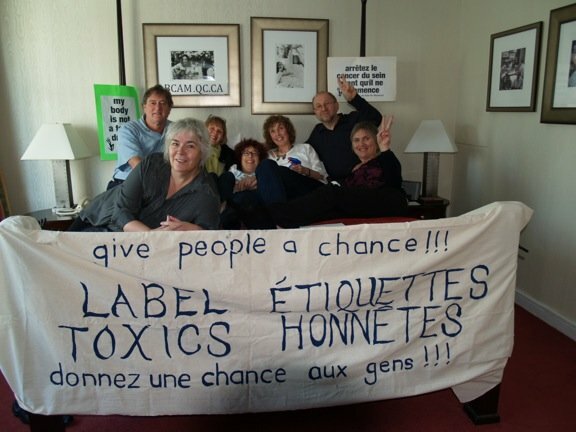 Just as a bunch of us climbed on the Lennon/Ono bed surrounded by inspirational photos and the echoes of ‘ Give Peace a Chance’ resonating from the walls of the hotel suite, we too can create a public groundswell for right to know about cancer causing chemicals in products. So go and sign the petition to Minister of Health, Leona Aglukkaq. Alert your friends on Facebook to do the same, write letters to the editor, hold similar events in your communities and take action. And stay tuned for the posting of the BCAM Tube videos of ‘ Bed In 2011′ which will really help this public campaign go viral!